Due to high demand or short supply? The 80GB Zune is reportedly selling so well that US retailers such as Amazon.com are in short supply or sold out already, a leading analyst tells us. Although some reports state that the Microsoft Zune is actually selling better than its arch rival, the Apple iPod, those reports pointed to the sales spike when the 30GB Microsoft Zune went down in price, according to iSuppli. "The question is whether the 80GB Microsoft Zune shortage is the result of high demand, short supply or some combination of both," says Chris Crotty, senior analyst for consumer electronics at iSuppli. 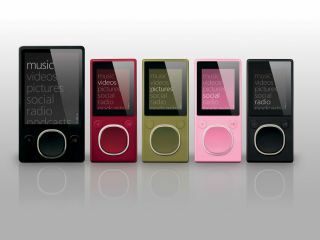 "Given the widespread criticism of the first Microsoft Zune model, it is likely Microsoft erred on the side of caution when placing initial orders for the new Zunes, which include the hard disk drive-based 80GB Microsoft Zune as well as the flash memory-based 4GB and 8GB Microsoft Zune," Crotty added. Crotty went on to question Microsoft's decision to play cool, waiting almost a year to follow up its first-generation Microsoft Zune with an 80GB version and the flash-based players. "Certainly, Microsoft had sufficient resources to develop the products more quickly, and there was no shortage of flash memory or of the controller integrated circuits that are the main semiconductors used in its players." Microsoft was also late to bring out Wi-Fi capabilities in its players compared to rival makers, as well as its long delay in adding more content, particularly video, to its Zune Marketplace website. Perhaps Microsoft is moving tentatively because the company is treading some unfamiliar territory with the Microsoft Zune, the analyst noted. For example, the Microsoft Zune uses a proprietary, closed operating system that differs from the open approach of the company's flagship Windows software. Furthermore, Microsoft is still a relatively small player in the personal media player market, whereas it is used to dominating its other business areas. iSuppli predicts that the personal media player market will amount to 211.5 units shipped and $19.5 billion revenue in 2007.